Everyone knows that the McRib is Back, but did you know that the Bruins are back too? 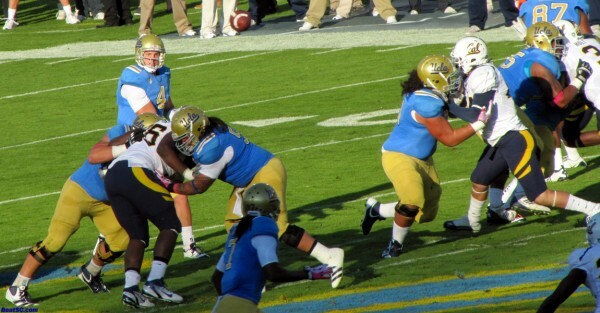 10 days after one of UCLA’s worst-ever losses, the Bruins turned it around on both Offense and Defense to overwhelm the Cal Bears, 31-14. The Bruins did what they couldn’t do in Arizona – The Offense ran the ball successfully, and the Defense held, on 3rd Downs. 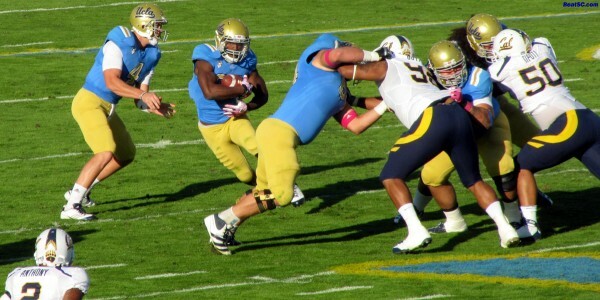 The Bruin Running Game was bolstered by the legs of Kevin Prince. The QB gained 163 of the team’s 294 yards on the ground, as the schemes and misdirection kept providing huge gaps for Prince to exploit. He took some hard hits, but did not show signs of being brittle like he has in the past. 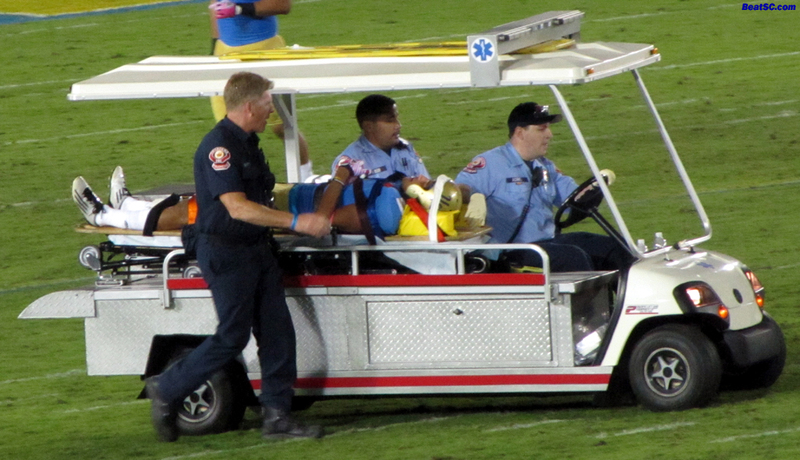 He always got up quickly after contact, never limping. His Passing was not sharp, but he was throwing to mostly new Receivers (due to suspensions), so the timing was understandably not there. But the Coaching staff compensated for the lack of a passing game with a more innovative Rushing attack, including some pitches. And it was Prince’s knack for knowing when and where to run that made the difference. Cal QB Zach Maynard was horrible, just like he was against sc, throwing FOUR Interceptions, including 3 to Tevin McDonald, and 3 in the 4th Quarter. 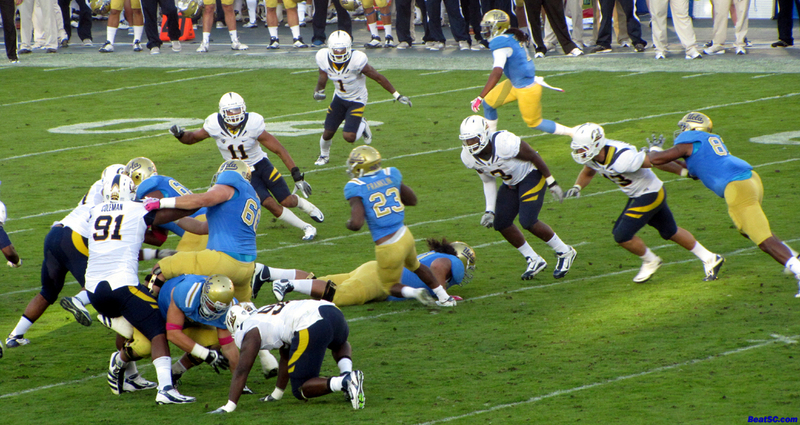 Cal was still very much in the game in the 4th, after capitalizing earlier on two Bruin Turnovers to get their two Touchdowns. 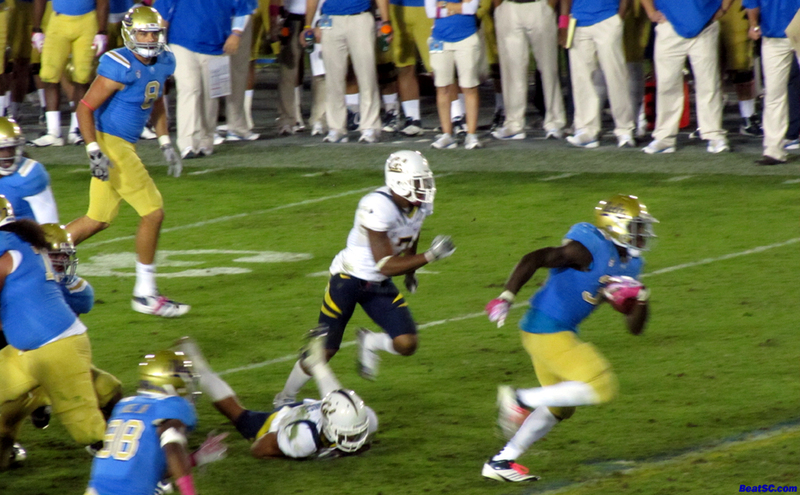 A Prince fumble led to Cal’s 1st TD, in the 1st Quarter, and after the Bruins took a 17-7 lead into the Half, a 3rd Quarter Punt muff by Jordon James led directly to Cal’s 2nd TD. Down by only 3, Cal had several chances in the 2nd Half to tie or take the lead, but they missed a Field Goal, and then turned the ball over every other time. The Defense played nothing like they did last week. They pressured the Quarterback, they made solid hits, they stopped 3rd Down attempts, and they held on to bad passes for Interceptions. Could it be that they have finally seen the light? McDonald’s first two INT”S were on poorly-placed throws, and the third one was on a pass that hit the hands of the Receiver first. But each time, Tevin had the presence of mind to focus on the ball and attain possession of it. 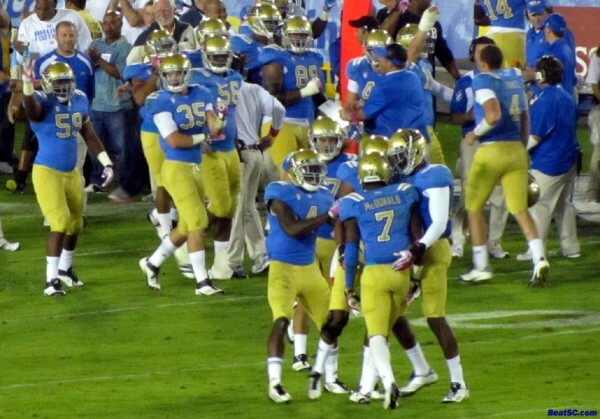 Did the UCLA Coaches do something different? Were the players better-motivated? Was it the Home Field Advantage? Or was it just Cal sucking? The Coaches definitely deserve SOME credit, but it was NOT a perfectly-coached game. 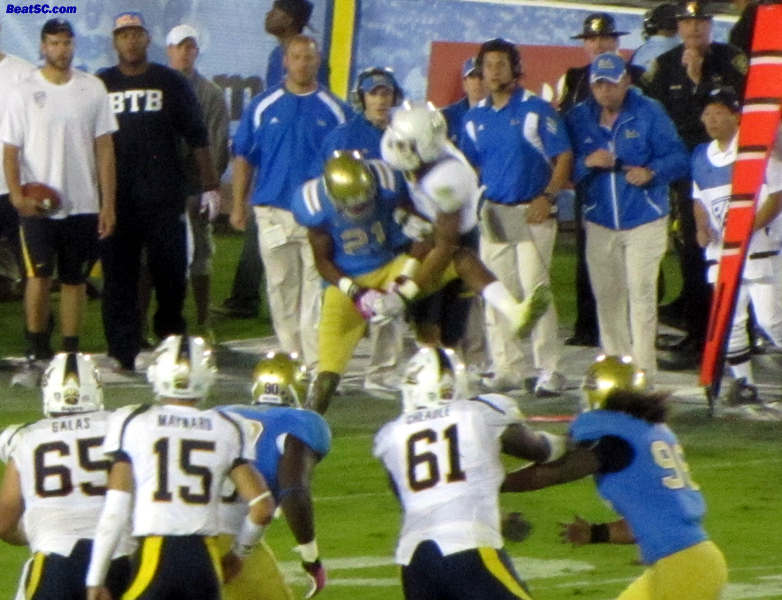 At the end of the First Half, the Bruins had the ball, up by 10 near midfield, and instead of trying a Hail Mary, they actually PUNTED the ball for no apparent reason. Why not heave it towards the end zone? What do you have to lose? Then early in the 3rd, instead of having Andrew Abbott or Josh Smith receive the Punt, they tried Jordon James again. James has struggled mightily in this capacity, fumbling one in the August intrasquad scrimmage, fumbling several more in practice, and then muffing at least one more during the season. 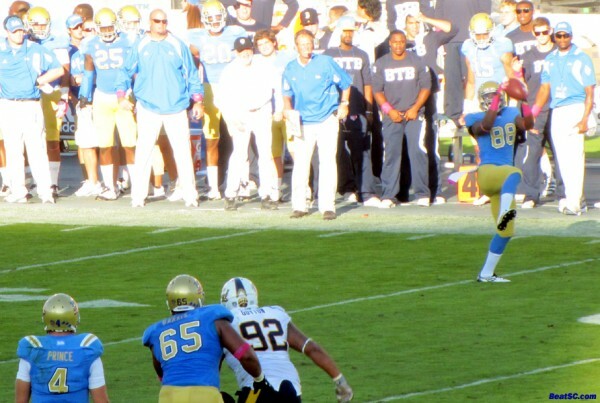 Despite the fact that James has been an excellent weapon for the Offense this year, and is definitely explosive, he is obviously not ready to field Punts, so the Coaching staff should not have had him back there at this point. The third stupid Coaching maneuver came near the end of the game: Up by 17 in the waning moments, the Coaches were still letting Kevin Prince carry the ball and take hard hits. Why in the World would you subject your only capable QB — who has a history of injuries — to more punishment when the game was already decided? 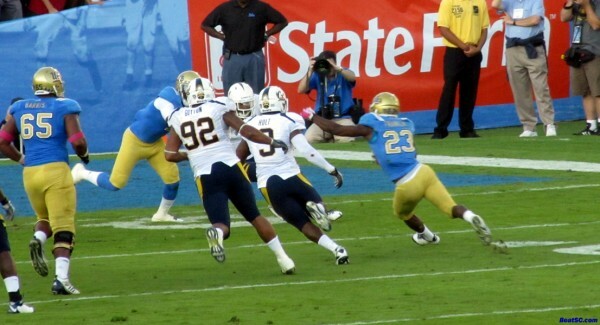 Despite the victory, it is decisions like these that indicate why Rick Neuheisel’s job is in final jeopardy. 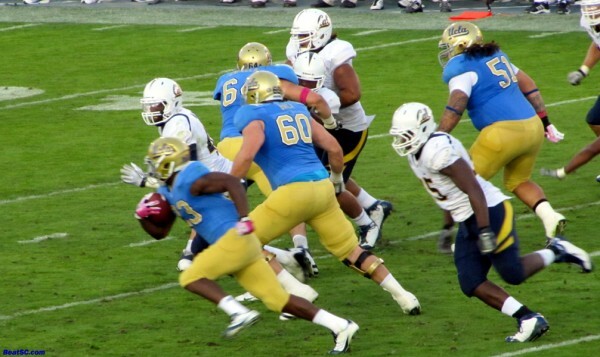 Of course, now that the team is 4-4 and still has Utah and Colorado on the schedule, it is possible that the Bruins could make a bowl game and save Neuheisel’s job. Maybe u$c paid Maynard to take a dive? And speaking of u$c, they choked away a 10-point, 3rd Quarter lead at home against Stanford, ultimately losing 56-48 in 3 Overtimes. Natually, a huge penalty on a Headhunter shot by T.J. McDonald extended the Cardinal’s crucial comeback drive. 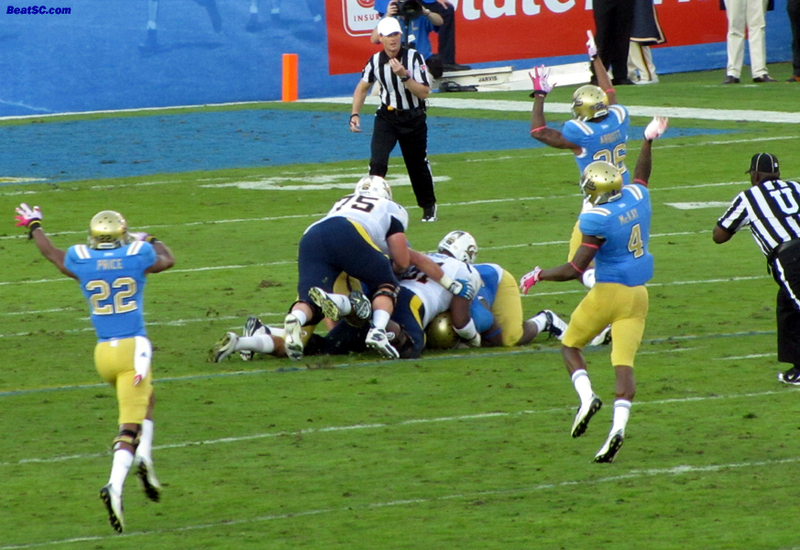 Then, despite getting every break from the Refs in OT, including a mysterious no-call of a blatant Holding Penalty on a key big gain, and an Offsides on a WR that was just completely missed on another huge play, the trojans still couldn’t eke out the W. They finally died when Curtis McNeal fumbled the ball into the end zone on a 1st and Goal from the 4-yard line. It was the BEST kind of trojan loss: A real HEARTBREAKER. Below are 44 Game and Cheer photos from Saturday at the Rose Bowl. Remember to click on the horizontal ones to ZOOM way in. And also keep in mind that I took 962 photos at the event, so there will be many, many more getting posted over the next 6 days. 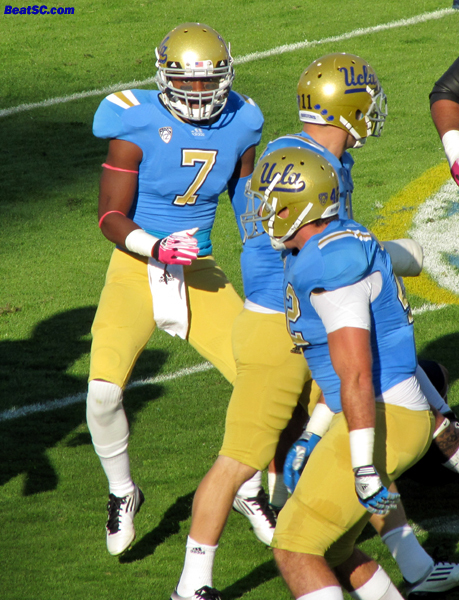 #7 Tevin McDonald — You want fries with that shake? 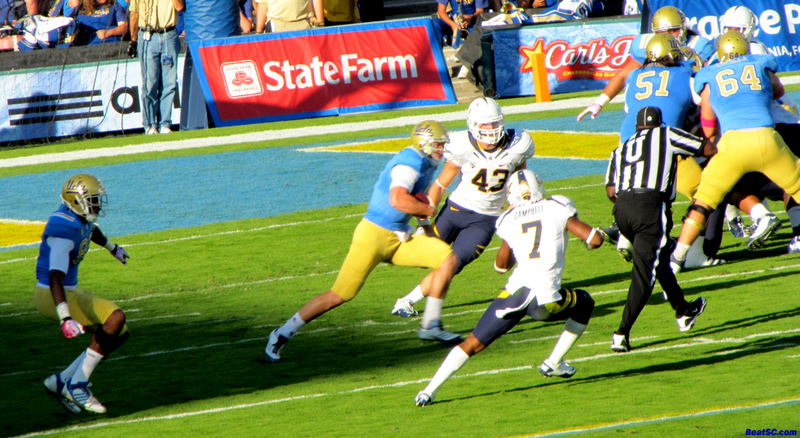 A Bruin defender (Stan McKay) makes a solid hit. Will it be a trend? Welcome to the starting line-up, Stan! …but it was Prince’s RUNNING that made the offense effective. Look at that open space! Prince ran in traffic too — Took some hard hits, didn’t get injured! Derrick Coleman scores 1 of his THREE Touchdowns! Maya word! I’ve never seen such a thing! Lizzi, in my “Photo of the Week” — Does it make you weak in the knees? Savannah. Need I say more? 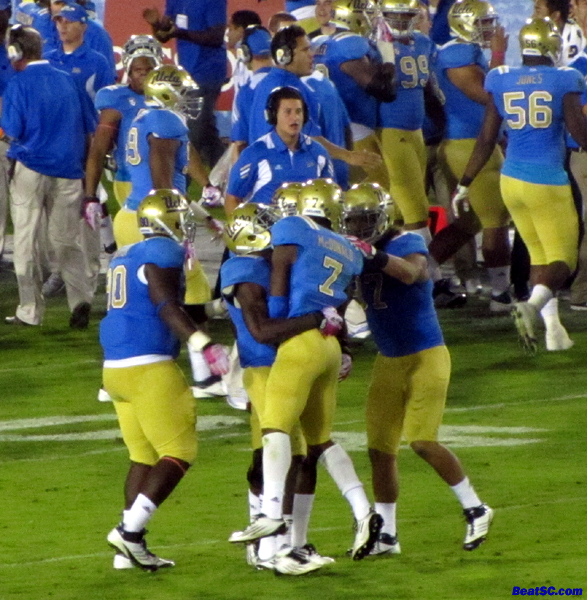 "TRIPLE RIPPLE" was published on October 30th, 2011 and is listed in Blue & Gold News, News from the Dark Side, UCLA/usc/Cheerleader Photos, UCLA/usc/Sports Photos. UCLA making a bowl game should not be all that is required for CRN to save his job, unless UCLA is satisfied with having the football standards of Indiana U.
Ahh finally a comfortable win. But i agree with jc, we need a guy that can recruit. great saturday. a win, a suc loss, and the dance team. can’t ask for anything more.